BishopBlog: Controversial statues: remove or revise? The Rhodes Must Fall campaign in Oxford ignited an impassioned debate about the presence of monuments to historical figures in our Universities. On the one hand, there are those who find it offensive that a major university should continue to commemorate a person such as Cecil Rhodes, given the historical reappraisal of his role in colonialism and suppression of African people. On the other hand, there are those who worry that removal of the Rhodes statue could be the thin end of a wedge that could lead to demands for Nelson to be removed from Trafalgar Square or Henry VIII from King’s College Cambridge. There are competing petitions online to remove and retain the Rhodes statue: with both having similar numbers of supporters. The Rhodes Must Fall campaign was back in the spotlight last week, when the Times Higher ran a lengthy article covering a range of controversial statues in Universities across the globe. 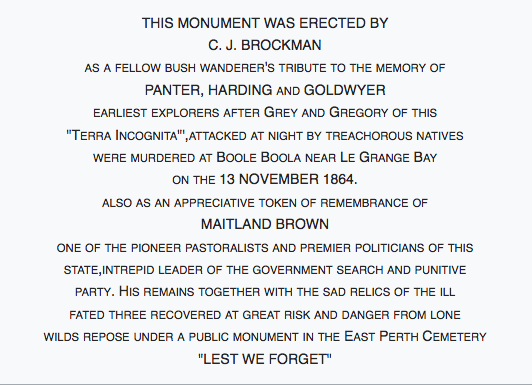 A day before the article appeared, I had happened upon the Explorer's Monument in Fremantle, Australia. 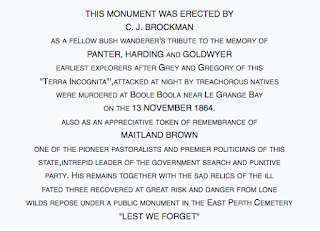 The original monument, dating to 1913, commemorated explorers who had been killed by 'treachorous natives' in 1864. 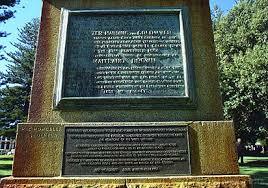 As I read the plaque, I was thinking that this was one-sided, to put it mildly. But then, reading on, I came to the next plaque, below the first, which was added to give the view of those who were offended by the original statue and plaque. I like this solution. It does not airbrush controversial figures and events out of history. Rather, it forces one to think about the ways in which a colonial perspective damaged many indigenous people - and perhaps to question other things that are just taken for granted. It also creates a lasting reminder of the issues currently under debate – whereas if a statue is removed, all could be forgotten in a few years’ time. Obviously, taken to extremes, this approach could get out of control – one can imagine a never-ending sequence of plaques like the comments section on a Guardian article. But used judiciously, this approach seems to me to be a good solution to this debate. I would go with the multiple plaques approach. I'd also want to read up on what Rhodes did before condemning him as I have almost no trust in “conventional” explanations of historical events which often seem to be gross oversimplifications and distortions. He may have been as bad as we now hear, he may have been worse or he may well have not been “bad” in the context of his times. The accepted story of Galileo being condemned by the Catholic Church because he advanced a heliocentric theory is one that drives me crazy. I'm curious about your objection to the story of Galileo. I don't know much beyond that basics taught in high school. Well my understanding of the “received wisdom” is that the Catholic Church simply denied the existence of a heliocentric system and condemned him for heresy for advancing such a mad idea. This is usually shown as the evil Church suppressing knowledge to defend itself and its mistaken beliefs. It was true that the Church hierarchy (along with just about every other European believed in an Earth-centered universe, based on some biblical entries, Aristotle, who was considered the final authority in matters of “Science” and most or all of the ancient astronomers such as Ptolemy. However the Church had no real investment in defending an Earth-centered model. Heliocentric, Earth-centric, neither interpretation affected core Christian/Catholic dogma. If someone could prove heliocenticity was correct then a bit of work by a couple of tame theologians reinterpreting said bible passages would handle the issue with a reinterpretation in light of new knowledge. The shock that Aristotle might have been wrong would have been tremendous but he was a pagan, after all, so it would not affect fundamental belief. The Catholic Church never insisted on a strict literal interpretation of the bible. On the other hand, the Church. like Carl Sagan held that, “Extraordinary claims require extraordinary evidence”. And to date, everything supported the Earth-centric model. I am not a Galileo expert but as I understand it Galileo made several mistakes that got him hauled up before the Inquisition. First off, he had already been warned about publishing this kind of theory 'as if it were true'. As far as I can see, the Church had no objection to such a theory being proposed as a fantasy or “what if" thought experiment. He published the theory as being “true”. This is not a good move when your friendly local despotic government told you not to. Secondly, he, accidentally, managed to convince the justifiably highly-paranoid Pope of the time, formerly a strong Galileo supporter, that the character Simplissimus in the publication was a caricature of himself. Ticking off a paranoid absolute ruler is not a great idea and may be what triggered the inquistion. Thirdly, for various reasons—mainly it seems be cause Galileo was a bit of a bumptious person—he had annoyed some of the Jesuits. The Jesuits of the Pontifical Observatory were some of the foremost astronomers at the time. One should not alienate one's usually friendly expert witnesses. Lastly the theory was wrong. I don't remember, if I ever did completely understood, the details but a serious problem with Galileo's theory was that it predicted one tide a day. Galileo had managed to put himself in an extremely awkward political situation, alienating most or all of his allies, and then had to defend a theory that anyone who had lived on the Atlantic seacoast would know was wrong. As far as I can tell he got a fair hearing from the Inquisition. He just had no reasonable defence. He did not even get convicted of heresy but rather of, if I remember the term, “strong suspicion of heresy' which was good as heresy could carry the death penalty. Galileo, who was by this time, in his sixties, suffering from serious arthritis or rheumatism and going blind (was blind? ), ended up in 'house arrest' in his own home outside of Florence. He proceeded to write two or three more books although, I believe, he took the precaution of publishing them in Amsterdam. So basically the Church did not sanction Galileo for his heliocentric theory, but for being unable to support the claims.